28 Apr Visual Merchandising – A Silent Salesman in Retail. As I embark to write this article on visual merchandising which is often kept at last number in the priority list of Retail CEOs, COOs or is often left to Operations team to decide & manage along with store operation. I feel it is important to highlight the importance of Visual merchandising in brand building initiatives and developing loyal customers for the brand. During the course of my retail journey, I got hands-on experience in managing VM teams and leading VM functions for a couple of middle-eastern brands in my retail career and I have often considered it and have given this function more priority than Marketing or advertising functions in retail mix. It is my sincere attempt to clarify some fundamental principles of Visual Merchandising to brand owners, retailers and retail professionals so that they can re-energize their brands using Visual merchandising strategy. Visual merchandising, also known as the ‘silent salesman’, suggests selling by display and presentation. Visual merchandising focal points are situated strategically to circulate the customer in the store and communicate the capabilities and advantages of the merchandise. This is completed by converting a passerby to a browser with an successful window display, a browser to a spender via the process of ‘conversion’, a spender to a major spender by increasing the ‘ticket size’ assisted by the method of cross-merchandising. Extension of Brand’s Identity and communication: Visual merchandising is an extension of Brand’s image and should be in sync with brand’s communication strategy. Imparting outstanding Shopping Experience Visual merchandising enhances the shopping experience by creating suitable ambience, producing an image of the store in the minds of the customers via a combination of colors, display presentations, graphics, lighting, forms and fixtures. If completed in an exciting and dynamic fashion, the shopping experience would be pleasurable for the consumer and make him/her come repeatedly. Communication Tool Visual merchandising communicates to clients the right message about the merchandise by projecting the latest trends, colors and fashion in apparel retailing. Visual displays are the great communication drivers & deliver an opportunity for retailers to sell a variety of merchandise. Theme displays based on a season or an event is employed to promote a proper product range. Coordinated displays contain items that are typically utilized/ sold/ consumed together, growing several purchases besides educating or informing the customer. Classification dominant displays contain all varieties of 1 item, are used to convey the impression of a wide selection. Importance of VM strategy in Purchase cycle: Consumer’s perceptions, aspirations, motivations and memories play an important role in purchase cycle. VM alters the perception and attitude of the consumers, forcing them to buy the product in a way that he/she enjoys purchasing goods thus leaving an everlasting shopping experience. 31% of the consumer’s purchases in lifestyle products are impulse purchases thus a store with good displays and theme and décor attract eyeballs, thus increasing footfalls and thus converting footfall into sales. 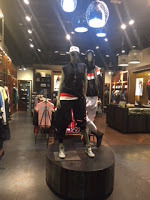 How well the store presents its merchandise using displays relates to the generation of brand imagery. Involvement of sensory, emotions, attitudes during the buying process decision provides enjoyment and satisfaction to shoppers. Exterior presentation:sign boards, store exteriors, store signage, window displays and banners. Store layout:merchandise flow, category zoning, ease of accessibility of merchandise, lighting concept. Store interior presentation: Merchandising principles, color coordination/ stories, merchandising techniques using mannequins, lighting, music etc, using props to highlight product, pricing signage’s to communicate “Hot deals”, floor and wall coverings, space design to ensure proper circulation of customers across the stores, defining hot and cold walls in store layout process. Visual Merchandising offers a Multi-sensory experience for the store to its customers. Live Displays are used sometimes for product displays at the entrance of the store to demonstrate the use of products. Children’s stores often use people dressed as cartoon characters to attract kids’ attention. Island Displays are displays of merchandise found generally at the entrance of stores to announce new arrivals, special offers, etc. A display podium is erected and decorated suitably. I would like to end my article with a video of my interaction with Mr Anand Kumar, Executive Director- ABRA VM&SD as he shares his wisdom of running a company which specializes in creating a visual retail environment for some of the biggest luxury brands in the Middle Eastern region. Anand shares a couple of tips for Visual Merchandising managers and Retail CEOs which is very relevant in current times of economic downturn and would help retailers develop their Visual merchandising strategy in sync with overall brand strategy. Contact me on riteshmohan@yahoo.com in case you are looking at getting the fresh perspective of your business strategy, I would be glad to share my wisdom with my industry friends and connections.